Bonkers Louis Malle film set in a not so distant future where the war of the sexes (literally) is in full swing. Lily (an Alice in Wonderland type) stumbles across a farm (Malle’s own county pile in fact), and ends up being drawn into the weird goings on inside. 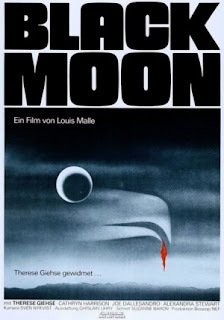 Malle made the film up as he went along and it shows, there’s almost no dialogue and what little there is emanates from the mouth of the various animals rather than the humans. Best approached as the sort of film you'll probably only ever watch the one time. But if you're a fan of Malle then it at least deserves that one viewing.